The climate control seat is provided to cool or warm the seat during hot or cold weather by blowing air through small vent holes on the surface of the seat and seatback. While the engine is running, push the rear portion of the switch to cool the seat, and push the front portion of the switch to warm the seat. When the operation of the climate control seat is not needed, keep the switch in the OFF position. • The climate control seat defaults to the OFF position whenever the ignition switch is turned on. The climate control seat is a supplementary cooling/heating system. 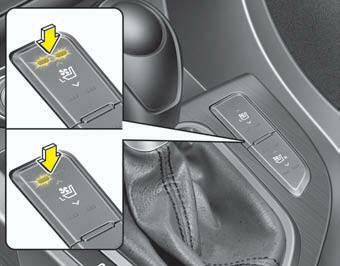 Use the climate control seat when the climate control system is on. Using the climate control seat for prolonged periods of time with the climate control system off could cause the climate control seat performance to impair. When cleaning the seats, do not use an organic solvent such as paint thinner, benzene, alcohol and gasoline. Doing so may damage the surface of the seats. Do not spill liquid such as water or beverages on the surface of the front seats and seatbacks, or the air vent holes may be blocked and prevented from working properly. Do not place materials such as plastic bags or newspapers under the seats. The air vent may not work properly as the air intake can be blocked. When the air vent does not operate, restart the vehicle. If there is no change, have your vehicle inspected by an authorized Kia dealer. The active headrest is designed to move forward and upward during a rear impact. 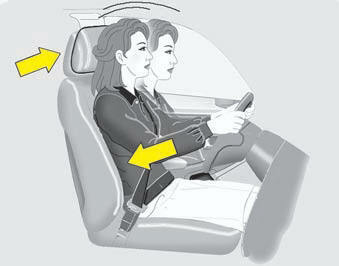 This helps to prevent the driver's and front passenger’s head from moving backward and thus helps prevent neck injuries. The seatback pocket is provided on the back of the front passenger’s seatback. Do not put heavy or sharp objects in the seatback pocket. In an accident they could come loose from the pocket and injure vehicle occupants. For proper operation of the occupant detection system, do not place any items cumulatively weighing over 1kg (2.2 lbs) in the passenger’s seatback pocket.